Weed control techniques include removing weeds by hand pulling, hoeing, flame gun and application of herbicide and also prevention of weed growth by application of residual herbicide which prevents weed seed germination. For small infestations of such weeds we would usually recommend a regime of control with herbicide and for large infestations a combination of excavation followed by chemical control. We can also install sub-terrarium weed barriers to restrict spread. The use of chemicals to control weeds carries with it a responsibility towards the safety of employees and other site users and towards the protection of the natural environment. 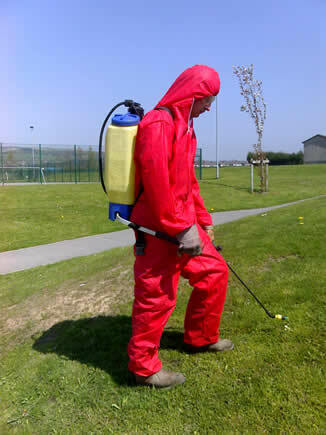 Consequently, any employees applying herbicidal chemicals hold appropriate and legally-required qualifications from the National Proficiency Tests Council and are provided with appropriate protective equipment. They are also trained to conduct and act on the findings of Environmental Impact Assessments to ensure that the right chemicals are only applied in the right conditions. Lancashire Landscapes carries out all weed control with environmental protection foremost in mind. Where practical and cost-effective we always employ chemical-free weed control techniques and, if chemical control is necessary, we use the safest of chemicals. Increasingly we are using only those chemicals which have a non-hazardous classification under the Control of Substances Hazardous to Health Regulations (2002).